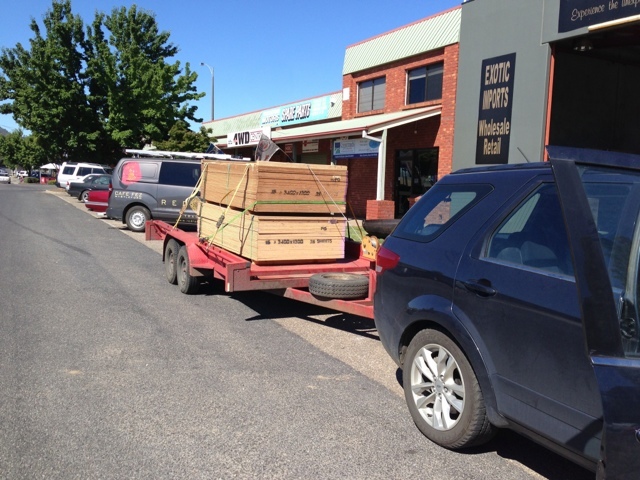 Only two things on the agenda today: fetch a fallen log from Jenna's place just down the road for poles, and make a quick dash up to Myrtleford to pick up a supply of 15mm plywood for the BAL-FZ roofing. First up, the log. It was 10am by the time we all made it to Jenna's, but it didn't take long to sort it out. The log is a 7.5m Messmate (Stringybark) which fell in a storm a year or two ago, between 250 and 350mm in diameter over its length and perfect for posts. It's not the straightest, and so we won't try to use it as a beam, but it'll give us three 2.5m poles nicely. First up - drag it out to the driveway so we could load it onto the trailer. 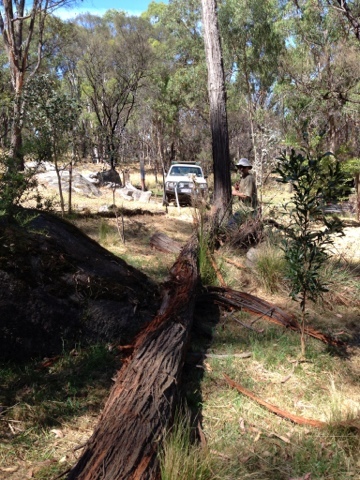 Peter strapped it to the bulbar of his Hilux, and did a remarkable job of not pulling the bar off as the log slid out from its home. A little maneuvering with a few crow bars and it slid onto the trailer with little protest. Two ratchet straps later and it's ready to go. 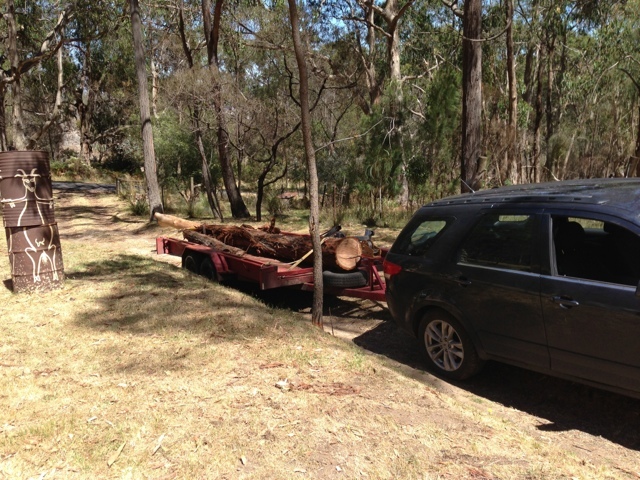 A leisurely drive up the hill and the log found its new home. Getting it off the trailer was pretty easy - I simply drove a star picket into the ground, ratchet strapped the log to that and drove the trailer out from underneath it. 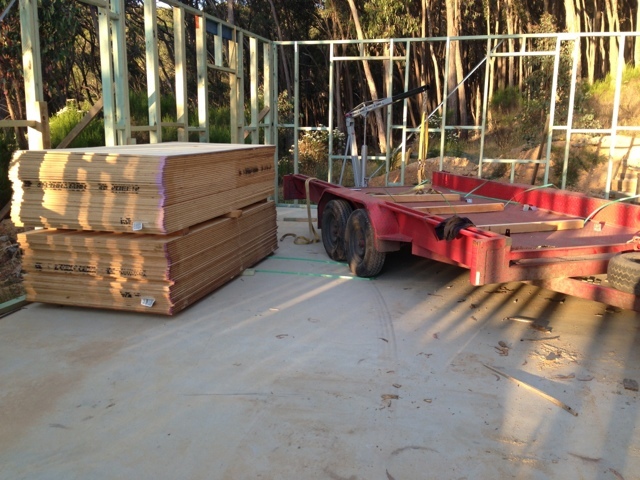 The aim was to pick up three packs of 35 sheets, but as it turned out the trailer wasn't either large enough nor rated for the weight of three packs and so I drove away with two. We're there again for Christmas, so I'll pick up the third then. With the trailer finally in position, I had originally planned to lift one pack with my engine crane and drive the trailer out from underneath it, but the packs were just too heavy - even with both my trusty ratchet straps, the crane couldn't get even one end of the ply in the air. 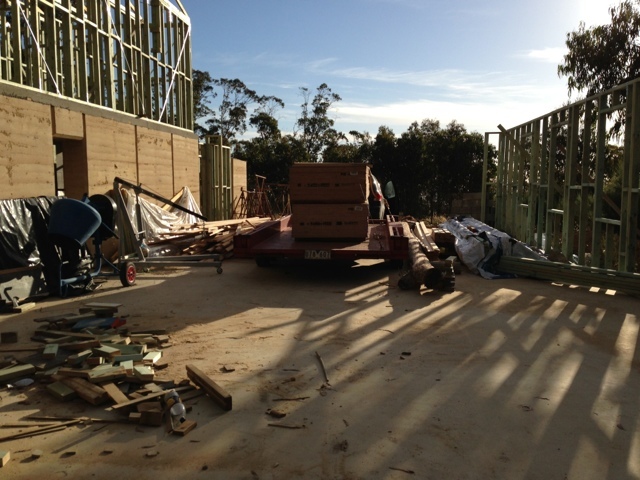 Plan B, then - good old fashioned manual labour. Half an hour later, and voila!